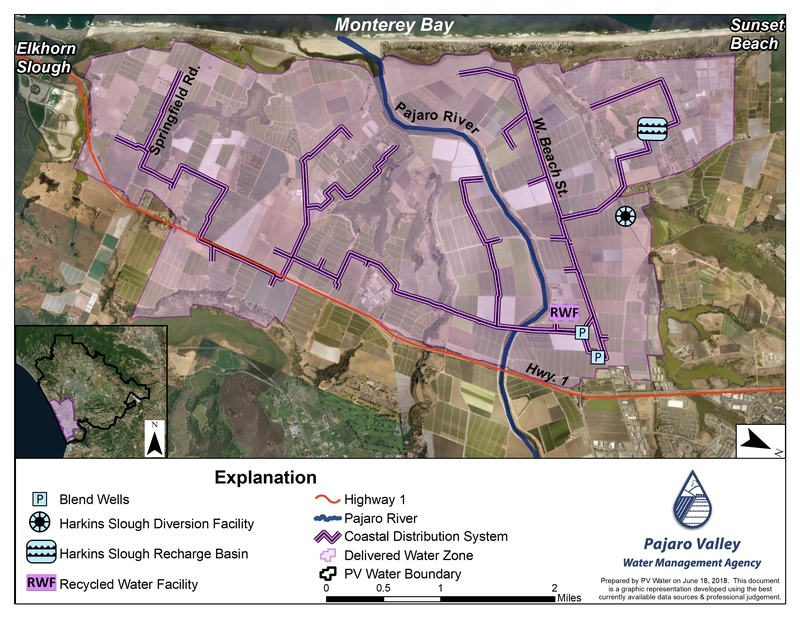 PV Water and the City of Watsonville closely monitor and test the tertiary treated, disinfected recycled water above and beyond what is required by the Master Reclamation Permit that was issued by the Regional Water Quality Control Board. Below is a table that shows the constituents analyzed, and at what frequency, as required by the Master Reclamation Permit for the blended recycled water produced at the Recycled Water Facility. Going beyond the sampling required by our permit (above), PV Water collects additional samples from a rotation of turnouts along the Coastal Distribution System at a minimum of once per month. These samples are analyzed for constituents relevant to the irrigation of crops. The constituents analyzed are provided in the table below. All the water produced at the Recycled Water Facility has been in full compliance with permit regulations since recycled water distribution began. The table below shows delivered water quality of select constituents based on a weighted quarterly averages of source water and volume. To view a print friendly table of results, click here for a PDF. Please note the table immediately above represents only a portion of the constituents analyzed by the independent, ELAP certified laboratory. The constituents listed in the table were chosen by the PV Water Water Projects and Facility Operations Committee. This Committee meets monthly and the public is invited to attend. Click here to go to where Committee Meeting agendas are posted.